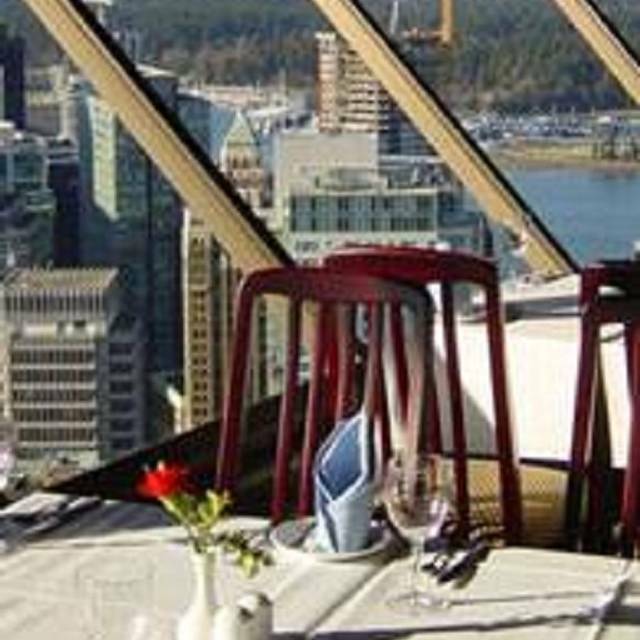 You must make reservations at least 5 minutes in advance of the time at Top of Vancouver Revolving Restaurant. Parkade located inside Harbor Centre. Public Pay parking only. Looking to show your staff a good time? Trying to impress clients? Top of Vancouver offers buyouts for larger groups during the holiday season. 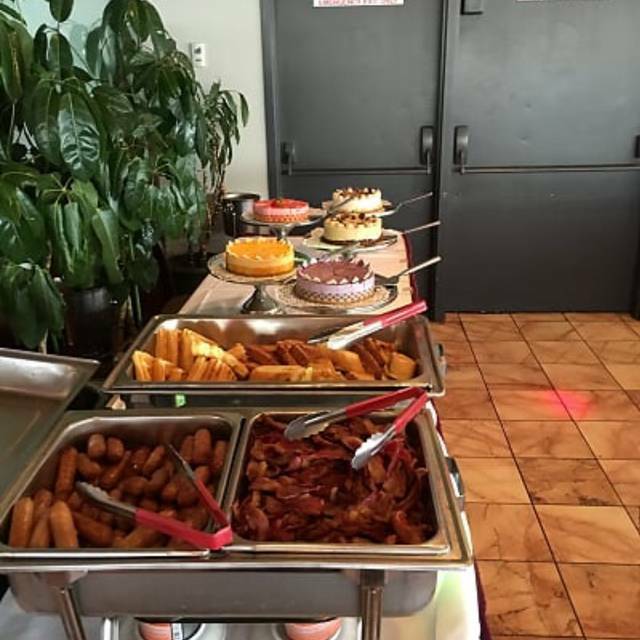 We offer great 3 course meals or buffets for groups of 100 or more. Cocktail parties are also welcome. Dates are filling up fast! Come dine at 553 feet! 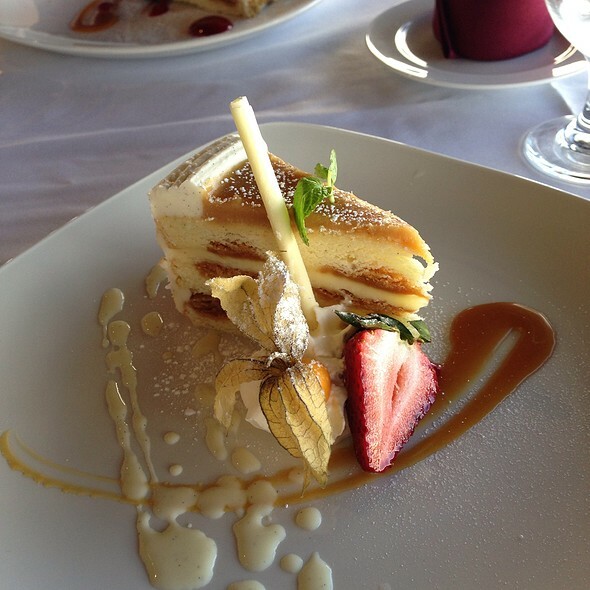 A stunning combination of great food and a magical panoramic view. Together it's what makes us famous! Unrushed, great dinner and wine with an amazing 360* view! Great service and wine suggestion. Awesome views, food, service. A must do in Vancouver!! Overall it was good, the food was exquisite the service would have been perfect and the surprise cake on top was a perfect touch, but the waiter touched my wife on the shoulder while he was speaking to us and laughing, I understand that he might not understand but in our customs it’s disgraceful to touch a married women. And it was her birthday so I decided not to make a scene out of it but next time not so touchy besides that he was very kind and attentive, thank you.. The views are obviously amazing but that is all you are paying for at this place. Service was disinterested but reasonably polite but the food was the real let down. The food itself seemed ok so I assume the chef needs some lessons in how to cook it. All in all it feels like they know people will pay for the views and experience so no one has to make any effort. Maybe a change of management would sort things out. Very memorable place to celebrate our daughter’s 14th birthday. All the family are happy and the view is spectacular. Service is awesome. Staff are so friendly and our server is the best. She’s so on top of everything. I highly recommend the place and will definitely go back again soon! All are very good including environment , food and service. For the purpose of being so high up and the maintenance costs to uphold that quality experience, I can understand the justification for the food prices. 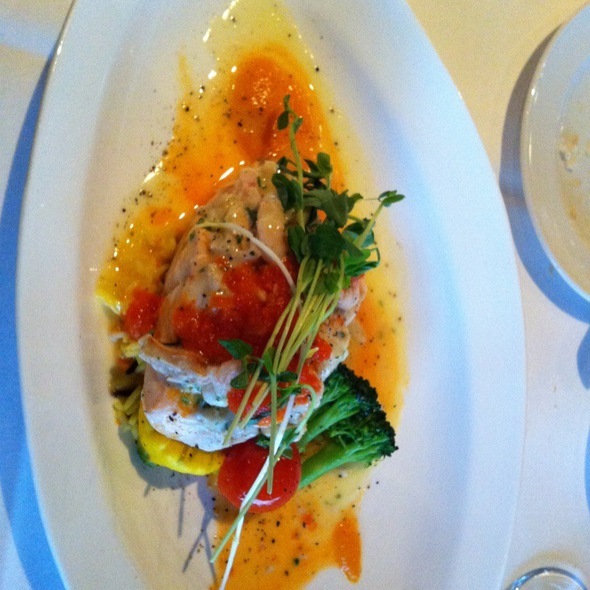 The food itself was very well done, the salmon was cooked perfectly and the recommendation from Tanaya (? - Sorry, I could not recall her name precisely but she was lovely and attentive to her duties) for the mushroom appetizer was spot-on. Overall, the ambiance was what I was hoping for, so thank you for the dinner experience. I will definitely consider coming again for special occasions :)! What an great experience!! Everything was amazing!! Best time for reservation would be around 5pm, where it was quiet and not to busy. It Is a must go to restaurant if your in the area !! Brought a client team to dinner. They were so impressed by the view and food. We wanted this to be a memorable trip and I think your restaurant made that happen. Thanks! 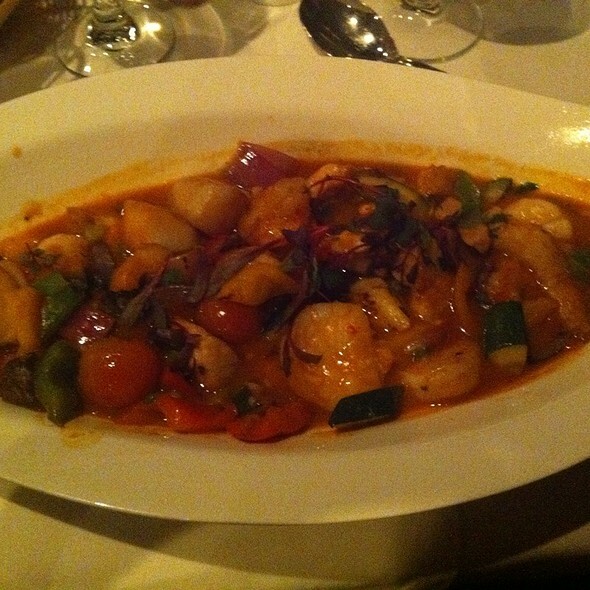 The ambiance was as expected and the service was good. The view was amazing, especially at dusk! However, the food was well below the standard for that price point. 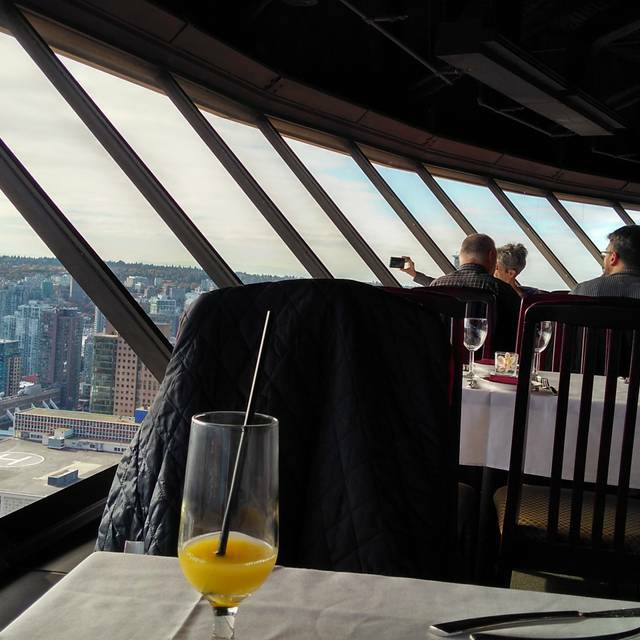 I’m sure you can get comparable views from the observation deck, one floor below the restaurant and not pay high prices for a meal that is average at best. This was my second time at this restaurant and I could clearly see that they’ve improved a lot! I really appreciated the fact that despite the fact that the closing time was at 10, they stayed open till almost 10:40 just because of our table. I’d strongly recommend this place. It was a delightful way to end our time in Vancouver. The views are spectacular, the service was outstanding, and dinner was delicious. The food was amazing, and obviously the views were incredible. The part that I couldn’t wrap my head around was their closing procedure. We made the reservation for 9:45PM, and the restaurant closed at 11. It took them that long to get our main entrees out, which was fine. But, in the middle of our main, the waitress brought over a dessert menu and told us we had to decide if we wanted dessert, and what we wanted, while we were still eating our entrees. She explained that the chef would be leaving so if we didn’t order then, we couldn’t have dessert. They started closing everything down while we were still sitting there eating. When the waitress brought over the bill, around 11:02, I asked about one of the vegetables that was served to us because I’d never seen it before. She informed me that she didn’t know what it was and that the chef had gone home for the night. I could hear the waiter at the table next to us rushing his table to pay up and get out the door as well. I would expect that kind of situation from White Spot, not a restaurant where I’m paying $200 to eat there. They want to be a fine dining restaurant, but they ruined our meal, and the experience by rushing us. My advice to this establishment is to not take reservations or seat guests that close to closing, if you aren’t prepared to allow them to get the full experience. the view is stunning. Food is not great. We had to send one meal back b/c it was cold with no compensation Not acceptable for a $45 plate. Other dishes had no flavor. 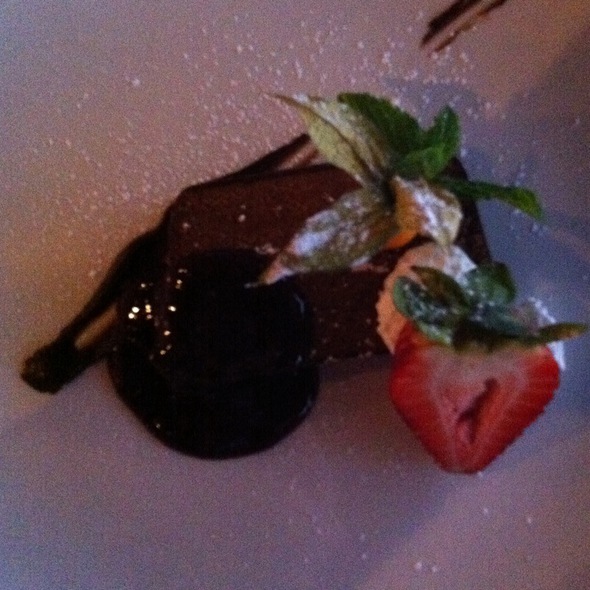 Dessert was very good. I would recommend coffee and dessert, skip the entrees. View of Sunsets and city lights beautiful. Wonderful place, we enjoyed the amazing view. The food quality and service is outstanding!! Like all of down town Vancouver, very pricey to the point that one feels taken advantage of. Hopefully the employees wages reflect the prices, if so I’m ok with it. But very much doubt it. the steak i ordered was cold and had a lot of tendons through out. the ambience was fine.. food not that great... service was wonderful. Enjoyed peaceful ambience. Good menu, good food, and good service. We prefer a weaker taste. Lobster bisque was too salty. It was my first time but my wife had been before. It was a fabulous night to celebrate our 2 Wedding Anniversary! The views and the food were just wonderful. You can't beat it. We will be back. Beautiful view great good. Large portions and delicious! We were there on a Monday night and the restaurant was less than half full. The service is excellent. My Salmon dinner was initially overdone but the waiter was very quick to have that corrected. The salmon came back just perfectly moist the second time. The view, of course, is excellent. We booked for dinner at around 6:30 pm so we can see both the daylights and night lights of the city and the harbor. Our server ANDREW was AWESOME and very good at his job! Fantastic view, great food and a great experience. Before going I read online reviews and was skeptical. However, our visit was great! Definitely a great dinner spot for a celebration. I was there to celebrate my girlfriend birthday and propose her to marry me. I requested/booked window view and they accommodate. The environment so perfect and the food is exceptional especially the steaks we ordered (cook to perfection). Hung and summer so attentive to our needs and Hung gave us a free 2 glass of non alcoholic sparkling champagne to celebrate our engagement. Truly a memorable service and great restaurant for me and my fiancé. Food was just awful. I’ll never return. Heard they use cheap ingredients by chinese owner. The $40 back ribs was so dried and coleslaw had no taste at all that I didn’t finish. The BBQ sauce was of like from the off the shelf in supermarket. I had expected the "tourist" trap (and I'm a local). We were there to celebrate 2 birthdays. The weather was glorious so the views spectacular. It was lunch, hardly any patrons (March). The food and wine are expensive so I was expecting small portions and as it's "tourist", mediocre food. Wrong on both counts. Had the kale salad (huge) and the warm seafood salad (huge, fresh, plenty of seafood). 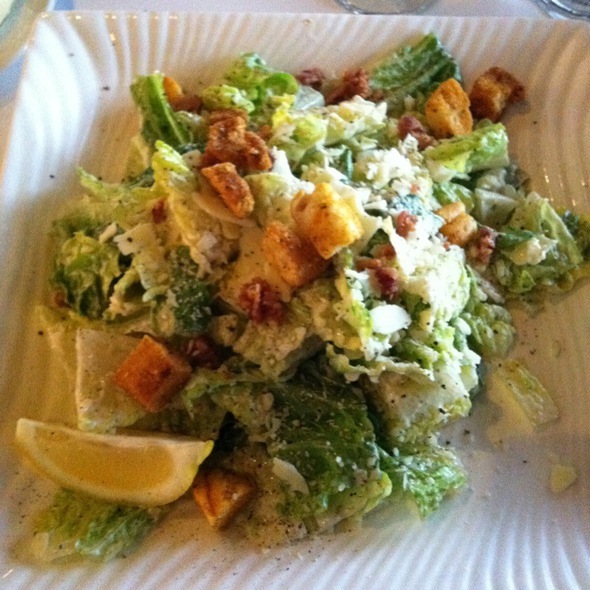 My friend had the romaine wedges with blue cheese dressing (huge) and the lobster ravioli (substantial and tasty). I also discovered that the bar is available for "just a drink" which would be a good place to go when it's time to see Vancouver "on high". We had a great time wandering through Gastown afterwards. 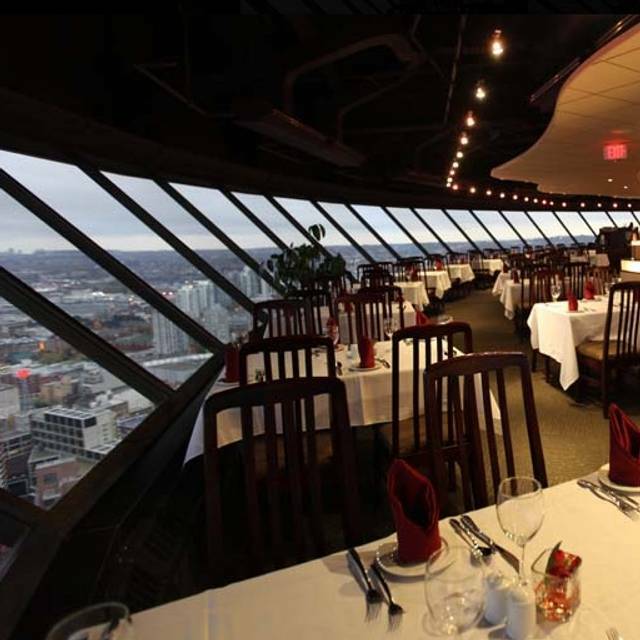 It was my first time in Vancouver and my family and I really enjoyed having dinner at Top of Vancouver Restaurant. Perfect view. Good service. Food was good. Server forgot our side order of mushrooms though. The view is absolutely fantastic and the server was attentive. Unfortunately the food was lacking. I ordered the baked lobster and it was tasteless, I actually had to ask for salt and pepper. It came with a side of vegetable barley that I barley touched. For the price point I did expect the food to be tastier. The lamb shank was nice and tender, good taste as well. Overall, this is an experience you do for the eye, not the taste buds. Food was completely overpriced. For how much you pay the food should been good. Service was poor too. Only reason to come here is fir the view. One of the best dining experiences in Vancouver. Amazing food and amazing staff!